The Sinclair Method, or TSM, is pretty simple—just take a dose of FDA-approved naltrexone one hour before the start of a drinking session to significantly reduce alcohol cravings. You can learn more about it here. And while TSM doesn’t work for everyone, it’s proven extremely effective for a lot of people. We recently surveyed Reddit and Facebook users to get their take on TSM and how it’s worked for them. Fifty-five people responded. Two of them told us it saved their lives, and four used the word “miracle.” Two-thirds of respondents now drink less than half of what they used to, including some who are completely abstinent. Here are excerpts of their Sinclair Method reviews, lightly edited for clarity. 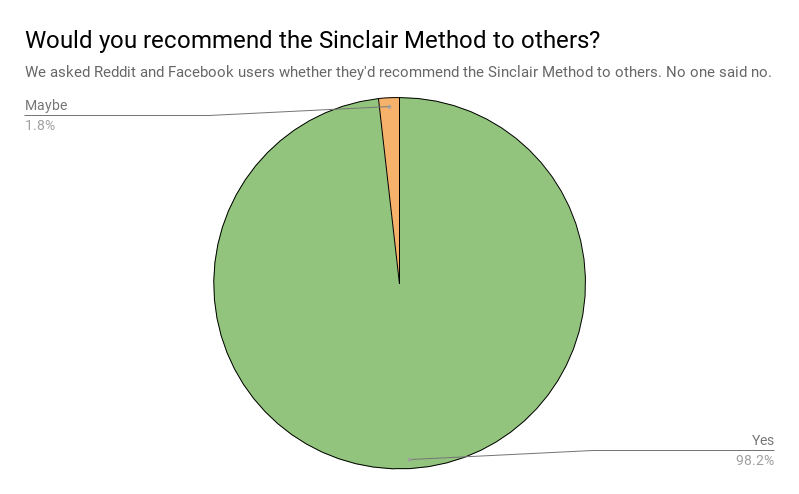 How has the Sinclair Method worked for you? I love it because I cannot fathom being without alcohol for the rest of my life. TSM allows me the freedom to choose to drink or not drink. That’s empowering! I used to “fall asleep” on the couch every night, and I haven’t done that once since starting on TSM. Wine doesn’t taste the same, and I’ve hardly had any mixed drinks—when I did they tasted way too sugary. I feel very in control. I just don’t have the desire to drink that much anymore. TSM is totally working as advertised so far. My drinking has been cut in half and I feel totally in control. It totally reduced the urge to pick up the glass. I accidentally forgot the pill one day and the urge to drink was massively higher. I’ve seen a decent reduction in drinking overall. It’s reduced enough that I’m not dying of hangovers or blacking out all the time. I still drink too much (per health guidelines), but my reduction in cravings has allowed me to return to lost hobbies, passions, and appreciate time with family. I’m hopeful that I’ll reach sobriety, and I’m not too worried as to when that happens. It’s working really well for me. I was a binger. Now, when I take naltrexone one hour before drinking, I generally can’t have any more than two drinks. I haven’t had any drinks or pills for weeks now, and I don’t feel like I’m missing out. Drinking didn’t feel any different to me when using TSM, but month by month I just became satisfied earlier in the evening. The compulsion to drink just seemed to slowly evaporate over a period of about six months. It totally works. I’m no longer up late drinking wine, and rarely drink alone. It worked beyond my ability to imagine. All cravings stopped March 2017. Mostly abstinent ever since. I have my life back. I feel less shame in drinking now and it has made a huge difference in my confidence. This disease doesn’t have to control your life, and you are not “weak” for not being able to white-knuckle or pray it away. This drug has been a life changer. This has been life-changing for me! I went out for my 40th birthday and barely drank while at a club dancing all night. I don’t feel like I make a fool of myself all of the time. I can count on one hand the amount of times I totally overindulged in the last year and even then, it was nowhere near my pre-TSM level of overindulgence. I used to have a cigarette occasionally in social settings with my friends, and now I have zero interest in those anymore. I haven’t felt this good or this confident in a long time! I feel like I am in control and that is a great thing! How much has the Sinclair Method reduced your drinking? I cut my drinking by more than 95 percent after using TSM for six months. I’ve stayed at that level for more than two years, with no temptation to drink more. I’m only 10 weeks in, but so far so good! I immediately dropped from 50 units of alcohol a week to 35, and now I’m down to 20. I’m the slowest of slow responders, but after 2 years of very close to 100 percent compliance, I’m now finally getting effortless alcohol-free days. More work to be done on the social drinking part of the equation, but total units are way down and life is good. I’m a year in, and I still drink daily with very few alcohol-free days. But I’m drinking on average 20 oz less of wine per day, which is just less than a bottle! I’m feeling very positive about it. When I compare my chart from this year to last year, it is astounding to see the difference. I immediately saw strong results. Before TSM, I drank about 60-80 units per week. That quickly dropped to less than 40, and then to 20-30 drinks per week. In my eighth month I went on a one-month vacation where I determined I was going to sample all the craft beers available—and I did, every day. That was a mistake for me. The other mistake was that I quit logging my drinks, and then I continued both of these bad habits when I returned home. At 10 months, I’m logging my drinks again and moving away from high ABV content, and I’m drinking between 20 and 30 units per week. Before, I’d have a bottle of wine or more every single night. Now, I have two glasses on average, four at most. I saw immediate improvement with TSM. My drinking virtually halved straight away. The addiction and habits took longer to break, but I kept at it and now in month seven I don’t have the urge to drink at all. I’ve never been happier or had so much hope for the future. It’s like a fresh start. My experience with TSM has been up and down. I’m just starting my seventh month, and I was very slow to see results. It was hard to keep faith that it would eventually work, but in the last few weeks I’ve seen dramatic reductions in my drinking and in my desire to drink. So I would say to others: It’s not a quick fix, you have to be very patient and trust in a process that sounds too good to be true. But if you hang in there, you will see results. I’m still working toward my goal, but I’m now quietly confident about eventually getting there. It’s been slow and steady progress, but now I only drink on social occasions. It took over a year for me. TSM initially helped to control my daily consumption, putting an end to my blackouts and hangovers. It took me six months to get alcohol-free days and a few more months to start stringing them together. After a year it was a bit like a switch and I have won this battle. The hardest part is the yoyo-ing, feeling like you make progress and then back pedal. But in the nine months since I’ve started, my drinking has reduced significantly. I’m down to about 3-4 bottles of wine per week from 1-2 bottles of vodka plus beer and wine. My relationships have improved tremendously. I’m no longer the one who drinks all the booze in the house, I can abstain easily if I need to be the designated driver, and I haven’t had a blackout in months. My best advice for anyone is to stay compliant and give it time. If you aren’t compliant it’s just setting back your progress, and there’s ups and downs. Some weeks I drank way more than I would have liked to, but other weeks I was pleasantly surprised how little I drink. Response to TSM can vary from person to person, but ultimately most people get there. Some respond quickly—like 2 months—but for most it takes many months. For me, I am at six months and not completely there, but I’m pretty confident I’ll get there just because of the progress I’ve seen over these six months. There were times, early on, where I didn’t feel like it was working at all because I was still getting extremely wasted. I even called some rehab facilities who were trying very hard to get me in; they were adamant that TSM doesn’t work. But I was less than a month in at that point, and old habits die hard. I would recommend everyone give TSM at least six months to show any progress before they tap out and go to AA or rehab. When I first began TSM it worked wonderfully. I would take the pill, wait an hour, and pour myself a drink. After just one drink my desire was just gone. I could hardly finish it. But after about a month my drinking went through the roof! My brain was searching for the old familiar and I was drinking again heavily every single night. Fortunately for me, that only lasted about five or six weeks and my drinking dropped off again. Now I’m going days or weeks between drinking. And when I do have a drink, it’s generally just one and then I switch to water. Ria Health helps its members reduce their drinking using FDA-approved medications—including naltrexone—and frequent check-ins with our medical team using our safe and secure mobile app. On average, our members reduce their drinking by 70 percent within the first six months. Learn more about how Ria’s program works and get started today. Hi. When this article is shared on social media, the subheading says, and I quote: “Taking low doses of naltrexone one hour before drinking can massively…” and that is inaccurate. I suspect that the metadata description of the article carried over text from an article about LDN at one point. Would you please make sure the metadata description of your social sharing tool or your article publishing platform (WordPress?) removes any reference to Low Dose Naltrexone (LDN) when talking about TSM? Thanks! Thank you, Mike! We will try to fix that. Appreciate your taking the time to write. Thanks, Mike (and sorry we’re just seeing your comment, which was buried in a torrent of spam). We’ll see what we can do to fix that, or — if all else fails — to make sure it doesn’t happen in the future. Appreciate your drawing our attention to this — and keep up the good work with C Three!